I walked my daughter to her bus, a big charter, the last of 3, took her picture as she signed in with the teacher, took another as she climbed aboard, thankful for the camera hiding the tears in my eyes. A myriad of moms laughed. “You’re not crying are you?” Ha ha! Others assured me that she was going to be fine and that she was going to have a great time. I know that deep, deep down in my toes, because I’ve asked Jesus to stay by her the whole time. And He will be there… this I know. He always is. She smiled big and blew me a kiss as the bus pulled out of the school parking lot. And my baby girl, my first big blessing, my first shooting star of a promise from God, headed out to be with her 5th grade classmates at Outdoor Ed for the next 3 days. And there’s a sense that this is a rite of passage, that she’s going to come back a little more grown-up, a little more individual and dare we hope responsible, a little wiser, a little less in need of a good mommy. I think that’s why the tears. I had a conversation in the grocery store yesterday with a mom also sending off her daughter but simultaneously sending off her 22 year old son… off to live his life on the other side of the country with a girlfriend. And she felt a sadness that all those nights of worry and loving and care… all have paid off and he’s done what he’s supposed to do which is to grow up and be self-sufficient… but where is her mommy role now in his life. Where does she fit in? And last Friday at the Fall Festival I talked with a mom whose middle school son may or may not be struggling with his grades. Mom is trying to back off and let him do his thing, which is the party line of the middle school faculty anyway. But she’s shrugging her shoulders and sighing and asking, “What’s a mom to do?” And under that sigh she’s really wondering what her role is, what is her sphere of influence, does she even have a sphere of influence with him anymore. I stepped up on my portable pulpit for a minute and preached it… God blesses us with children, they are truly a gift from Him, and it is our beholden duty as parents to lead these children even in the face of faculty saying they have to do it themselves. Borrowing a line from my husband, “as long as those children are under our roof,” it is imperative that we lead them, guide them, defend them, love them, model in our imperfect way the kind of solidarity God has with us. Before his son can raise another foot, Tom yells into the microphone, “Trent, stop! Don’t take another step!” Circling the traps, he positions himself in between his son and the bear trap. After whispering some instructions, he turns his back to the boy. Trent eagerly places his hands on his father’s shoulders. Then slowly, they begin navigating the trap field together. For Tom and Trent, the trap demonstration was a setup on a stage. But for you and your teen, the traps of adolescence are all too real and treacherous. This morning! As I’m packing the last of her things! For the next three days, I’m not going to be there to walk in front of her and guide her through the minefield. But that’s okay because Jesus is. This I know, for the Bible tells me so. And then I see Davion’s impassioned plea for a family. It was on my radar a week or two ago, but it popped up again thanks to Kristen over at Rage Against the Minivan. In case you’ve been hiding under a rock, Davion asked his social worker to take him to church one Sunday; he had a message to deliver. The message was that he wanted a permanent family; “I’ll take anyone,” he told the congregation. “Old or young, dad or mom, black, white, purple. I don’t care.” This young man has been in the foster system and he’s tired of not belonging. Just like the 101,000 plus kids waiting for a family in the US right now. organized, prayed over, loved on, even those smelly shoes (Heaven help her cabin-mates when the shoes come off). There are children for whom there is no Outdoor Ed, no mom crying on the sidewalk, no paparazzi photographing every move for posterity sake. There are children for whom no one is praying, for whom there is no soft bed laden with pillows and a mother’s gentle kiss and a father’s blessing. There are children who don’t know the kind of love and joy of a parent who marvels at their accomplishments, who cheers for them, defends them, leads them through the minefield of life. These are the Davions of our country. And the Scovias of the world around us. 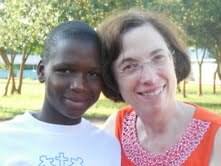 Scovia is a 14 year old girl living in Uganda. Her mother and father were both dead by the time she was 5; her father was killed by the LRA. Scovia now lives with her aunt and her family. They eat one meal a day… posho and beans. And Scovia is hoping to go to high school, if her grades are good and if she has the money, if she has the sponsorship. There are actually several thousand Scovias in Uganda, children who have seen their parents die of disease or be killed by the LRA, who have been rejected by family because they were abducted by the LRA, who run the family of younger siblings despite their own tender age. It’s estimated that 66,000 children were abducted during the 23 year war in Uganda. Millions have been displaced, killed, and maimed. Read the sponsorship page at Village of Hope sometime. Watch this video. Oh my gosh. The children. So I sit here on my knees, praying for Jesus to be with them too. Because Jesus loves them, too. This I know. But do they? Do they see that love daily in the face of a mom who would split the waters, race the desert, climb to the heavens if necessary? Do they hear it in the instruction of a fatherly voice? And if not… how do we… teach it, preach it, lead, guide, and defend? Davion said, “I want someone who will love me until I die.” Don’t we all? Jesus, come and rest by these children.